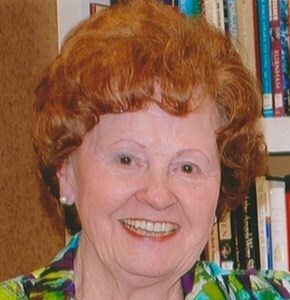 Dorothea JoAnn “Jody” Scott Cain Furman, 87, of Olathe, passed away on February 2, 2019, in her home at Aberdeen Village. She was preceded in death by her parents, Donald E. Scott, Florence Scott Sampson, and Ross D. Sampson; husbands, Clifford G. Cain and Courtney A. Furman; brothers, Donald E. Scott, Jr. and Jack C. Scott; sisters, Nonie Van Detta, Sue Bingham, and Lynne Flette. Visitation will be held Thursday, February 7, 2019, 1:00 -3:00 p.m. at Penwell-Gabel Cremations, Funerals, and Receptions, Olathe, KS. A memorial service will be held Friday, February 8, 2019, 1:00 p.m. at Aberdeen Village. Burial will take place at Ozarks Memorial Park in Branson, MO. lieu of flowers, memorials are suggested to The Good Samaritan Fund at Aberdeen Village or Samaritan’s Purse. Add your memories to the guest book of JoAnn Cain-Furman. I will always cherish the wisdom of Jody's gentle admonishment/encouragement to 'try never to do anything that brings shame to the name of Christ'. Jody knew how to be strong, yet flexible; she modeled living gracefully and productively. I will miss our correspondence and sharing of literary pursuits. Kevin and I offer our prayers and condolences to her large and lovely family, and to all whose hearts she so wondrously touched and deeply influenced. Thank you Jody for giving us all a little glimpse of the love in heaven through your friendship, kindness, and faithfulness! Mrs. Furman was a great encourager to her husband, Courtney, and to all of us students at School of the Ozarks. She went out of her way to help others and NEVER did I ever hear a negative word from her. She was a great servant of God and a beautiful friend. We corresponded frequently after I graduated. I've kept all the letters from her and from Dr. Furman. Although they both are sorely missed, they've left a great legacy having touched so many lives. I'm thankful to have had them both in my life. Now she is singing with the Angels. My life was richer having known her. May all of you be comforted with the knowledge that she is with the Lord. This lady was one of the sweetest people I've had the opportunity to meet in my life. Her position at S of O allowed for her to get to know most, if not, all of us. She became like that sweet aunt that it was always fun to see. Her hugs and smiles always warmed my heart. She admitted decades after I graduated that she was my secret benefactor while I was in college. Once a semester I would receive an envelope in my P.O. box on campus with a little note of encouragement and a $5 bill. I never knew who it was but I always thanked the Lord for whoever it was. That money was a true gift for this poor college kid from Wisconsin. We'll see her again on the other side and will we ever have the stories to tell. Thank you, Lord, for allowing out paths to cross. Thank you family of Jody for sharing her big heart with all of us. We were both Students at College of the Ozarks. We had classes with Courtney. We enjoyed going to their home after Church on Sunday’s and visiting. Courtney officiated our Wedding and JoAnn was there to support and help him. She was always a bright and shinning star when we walked thru the Offices. Always wanting to encourage and find out how we were doing and a hug was always welcome. We miss attending Church in Hollister and staying for pot luck. She was like another Mom. We miss them both. Our condolences to all the family. May the peace of God be with you during this difficult time.